As a user of Stack Exchange sites for a while now, I have often been frustrated by the lack or predictability in whether a question will be up-voted, down-voted or closed. In general, I do not ask questions that I believe to be off-topic. I always try to search for answers first and attempt to solve the problem on my own. But I am not an expert in everything and am not ashamed to admit I often seek the advice of others in areas where I am not knowledgeable. This past week I've asked two questions on Server Fault. Both were good questions that I could not find a good answer too, and both were, as far as I can tell, a good fit for this site. One question got 6 up votes, the other got 3 down votes and closed. If the later question was inappropriate, that's fine. How am I supposed to know what not to do in the future? With great power comes great responsibility, and those with the power to close questions have the responsibility to explain why, especially when the OP has made a reasonable effort to conform to the site standards. The specific question asks if using an online backup service such as Jungle Disk for our company servers creates any security liabilities for us and what can be done to avoid them. I would like someone to please explain how a question related to the security of backing up a server is considered "off topic" for a site about server administration. In general, there needs to be a degree of predictability in what is and isn't acceptable here. Every time I ask a question, I honestly have no idea whether it will be up-voted, down-voted, closed, or ignored. Questions on Server Fault are expected to generally relate to servers, networking, or desktop infrastructure, within the scope defined in the faq. I've read the FAQ and I believe this question falls within the defined scope. If it does not, please tell me why, and perhaps the FAQ should be updated accordingly. Specifically Re: the Jungle Disk question, half of this question is unanswerable in any meaningful way. Are there any known vulnerabilities with recent versions of Jungle Disk including 3.16? If I say "no" right now, 12 March 2012 15:08:59UTC the answer is valid for exactly 1µs, at which point John Q. Hacker finds a security hole and releases a zero-day exploit for Jungle Disk that divulges every bit of data ever stored on their network. This question is equivalent to asking us "Does this watermelon taste good?" before we've even cut it open. The other half of your question (Is there anything in specific that I should look for in anycloudbackup provider that indicates their solution is safe, rather than having to take their word for it?) 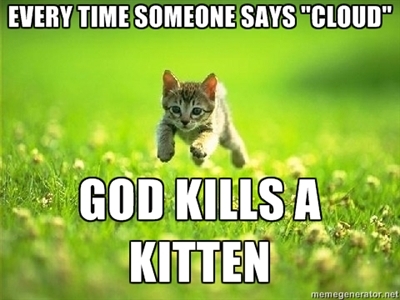 is more appropriate to Server Fault -- I would encourage you to post that as a standalone question (WITHOUT the "cloud" buzzword", please, for the love of kittens), either here or over on IT Security. This has been discussed over and over and it is a design decision to not require any explanation either for up/down- or close voting. I go even further: If you ask a question on ServerFault (or any SE site), no one has any obligation to you, at any point. If someone votes, he doesn't need to explain himself. If he doesn't followup on a question or comment because he ran out of ideas or the discussion get's off-track or he is tired, out of time or simply forgot about your problem: It's his right to do so and you must live with it. Of course, it's the purpose of SE to ask questions and get answers to them and the overwhelming majority of users here wants to help, but in the end you are entitled to nothing at all. (NB: I didn't vote on your question). Although I didn't vote on them I would suggest that your question touches on the "no shopping questions" part of the FAQ. You are asking what to look for in a product and asking whether a particular product is good. I think your question may have been down voted as it is similar to "What is a secure backup provider?" and "Is this particular backup provider any good?". These sort of questions age quickly. For your use case, a better question may have been (and possibly on security.stackexchange.com) would be "How do I protect my data if backed up to an unknown Cloud Provider"? It would be good if this had been pointed out when closed if this was the case. Didn't vote on the jungle disk question myself, but I could make a case for close on the basis that any answer will boil down to "Probably. Every thing's vulnerable to something. You'd have to ask them for the details." Can't see the other question so I can't comment on it. I'd agree that an explanation would have been useful, but you can see from the comments that it generated some confusion. Unfortunately I am not sure which choice I used when I cast the close vote, (the close reason, reflects the most popular choice). I am also not sure when I cast a close either, so I am not sure which edit I was looking at. I am pretty sure I was on my iPad at the time, and I usually don't add a comments from my iPad. I assume someone else will, or that the comment for the close reason will be enough. There where many aspects of your question that would be good here. But your question was and still is difficult to follow. Sometimes I get lazy, and when a question seems unfocused/unclear I will cast a close vote instead of spending time trying to figure out what the person was asking. I am a very strong believer in the inverted pyramid style of writing for questions. The very first paragraph should be the core question boiled down to be as clear as possible. Then you add additional details and back story to support your main question. The first problem is that the first two paragraphs are almost completely noise. All of it could have been handled by a link to the Jungle disk page. They do not really ask any questions, and they barely add anything in supporting details. The core question of the first version of your question could have been state like this. How does the Jungledisk daemon on my system authenticate the cloud backend. What mechanisms are in place to prevent it communicating from some malicious third party? If that had been your question I probably would have cast an upvote. You had this statement Once installed, the Jungle Disk server can see your server and can read, add and remove any files on your system. What server are you talking about? Are you talking about the local daemon running on your system or are you talking about the Rackspace/Amazon cloud backend? Perhaps you don't understand how the client works, but the cloud backends do not have any access to your system, jungle disk pushes files too them. This ambiguity of you saying server makes me think you are asking how secure Rackspace or Amazon is. I don't think anyone can really answer that in any useful way, that would have been closed as off-topic. Then you asked this bit if by installing the Jungle Disk service on an important server if that software could be exploited for nefarious purposes. Since this is a source is not available the daemon, the answer has to be absolutely. The software could be exploited, but without the source, and possibly even with the source it is impossible to answer that. Any program on your system, especially any program with network access has the potential to be abused. After some of your edits you added this. Are there any known vulnerabilities with recent versions of Jungle Disk including 3.16? This is too localized. If there are known vulnerabilities you can usually find them with a quick Google search, and that question isn't very useful here for the long term. You asked this. Is there anything in specific that I should look for in any cloud backup provider that indicates their solution is safe, rather than having to take their word for it? For example, a SAS 70 type II certified data center has been audited and found to meet certain security requirements.. This is worthy of a question all by itself, without all the other extraneous cruft in your current your question. A good generic question asking how to evaluate cloud backup providers, and any included agents/daemons and asking for specific objective criteria could be a good question. It would be a lot more useful if it was a question all by itself. So to summarize, I think you have been trying to ask two good questions, but the way you asked it, made it difficult to see them. Not the answer you're looking for? Browse other questions tagged discussion closed-questions close-reasons specific-question .